gingerbread houses and sugar cookies. We usually start around Thanksgiving and end around New Years. My kids just love this part of the holidays...and so do I. And we are going to do that with some #HolidayCandy! I hopped on over to Nestle's Very Best Baking website and took a peek at some of the holiday recipes. 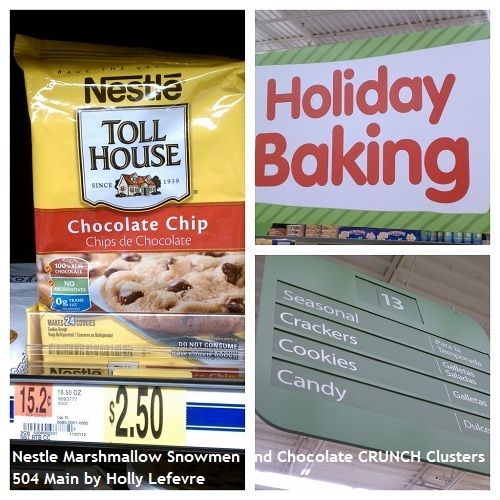 Some of the recipes were tasty cookies and cookie bars using Nestle Candies to add flavor and fun and others were cute little whimsical creations like snowmen and sleds decorated with the Nestle Candies. I decided that we were making the Marshmallow Snowmen. 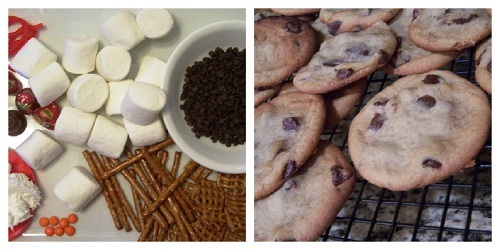 I actually let the kiddos take a peek at some of the very fun and tasty recipes and this is what they voted for! 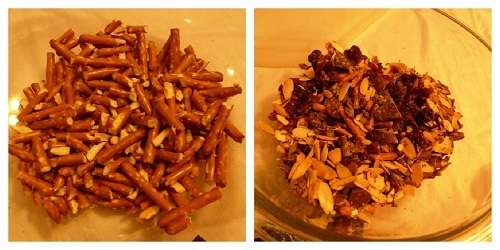 And we decided to make them on Thanksgiving as a kick off to the holiday season! before Black Friday craziness started. The store was very busy getting ready that day - balloons high in the sky, numbered aisles, and arrows marking the paths to the right line - crazy! You can read more about my shopping trip and path to purchase in my google+ album. Once we arrived home, I was anxious to try out the Snowman and create the new "cookie" for you! 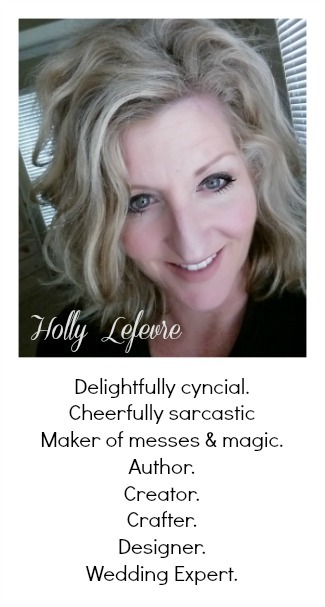 So, you did hear me - I have TWO RECIPES FOR DECADENT TREATS TODAY! COOKIES: Prepare the 12 cookies as per the package directions (cool on baking sheet for 2 minutes and then on wire rack until completely cooled). SNOWMAN: Insert 2 pretzel sticks into each side of 12 of the marshmallows. Spread a heaping teaspoon of frosting onto the cookie; top with snowman base. Spread additional frosting on top of each snowman base. Top with remaining 12 marshmallows. 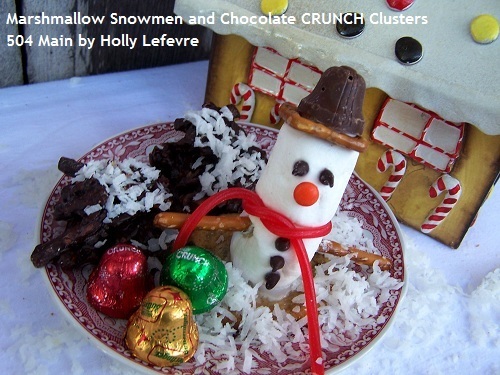 Dip orange candies and mini morsels into frosting and add noses, eyes and buttons to snowmen. For scarf, tie each piece of licorice loosely around neck of snowman using frosting as glue, if necessary. Let both hats and snowmen bases stand for 20 minutes to set frosting and make snowmen stable. (they might have extra arms and such though!). When I finished with the snowmen creations, I had quiet a few supplies left over so decided to make my own little cookie creation. so you should be set to try your hand at both! Spread a sheet of wax paper on a cookie sheet of the counter. 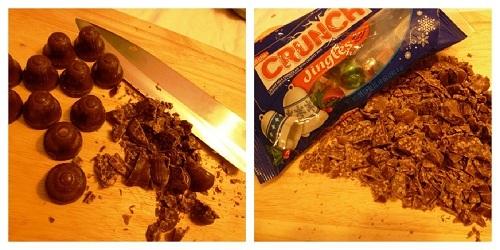 Break up the pretzels and Chop the Nestle CRUNCH Jingles. Place 1 cup (8 oz.) of the dark chocolate chips in a microwave-safe bowl (you can do this in a pan too) and cook on low for about 30 seconds at a time - all microwaves cook a little different - so be sure to watch the chocolate carefully so that is does not burn. Stir often. 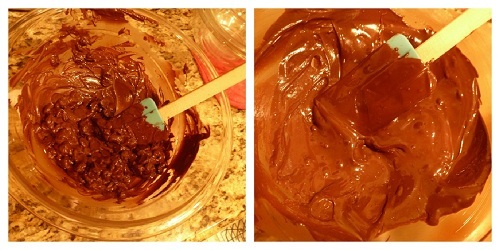 Add the melted chocolate (FYI: my chocolate took a total of 1 minute and 30 seconds to melt) into the bowl with the other ingredients. Stir well to coat all of the ingredients. Use a Tablespoon and scoop a mixture of the ingredients into stacks on the wax paper. OPTIONAL: sprinkle with coconut. Let dry and harden, about 30 minutes here! NOTE: I like sprinkling the coconut on top because half of our family is coconut loving and the other half is not...so I can make some for each of use this way! If you are wanting to bake up a sweet treat, Nestle Seasonal Recipes is your answer! through the holidays and every day! 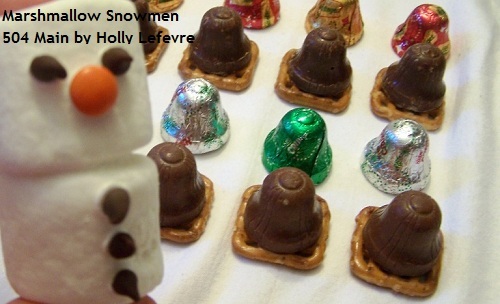 What a fun idea to use the chocolate bells and pretzels for snowmen hats!!! Very cute!!! Yum! I hope to do some baking this week too but we shall see if I have enough time! 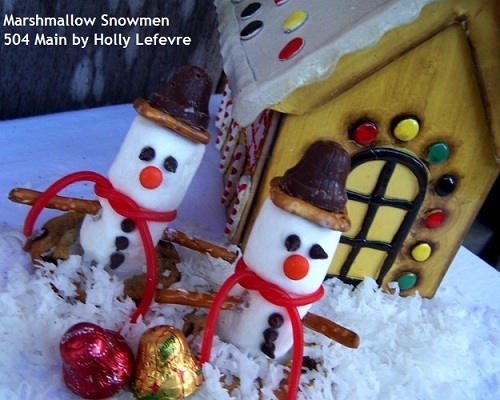 The snowmen are too cute....I would hate to eat them...but....I would do it! These are so adorable, love those snowmen! 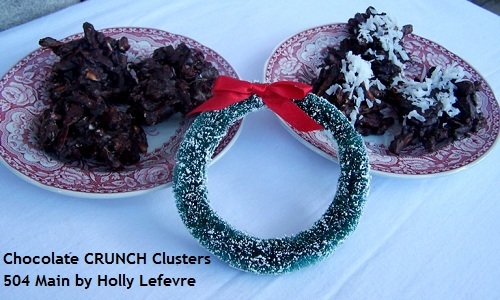 The crunch clusters look so good. I love sweet and salty! My favorite has to be the snowman's hat! Too cute! oh yum... you guys are killing me with all the candy!!! That's really cute Holly. We make something similar to the clusters-- but with butterscotch. YUM. Oh my gosh these are so cute! Pinning! so cute!! those clusters souns amazing!!! Ok, we'll now I want candy. :) Looks so yummy.